Product prices and availability are accurate as of 2019-04-20 06:39:04 PDT and are subject to change. Any price and availability information displayed on http://www.amazon.com/ at the time of purchase will apply to the purchase of this product. 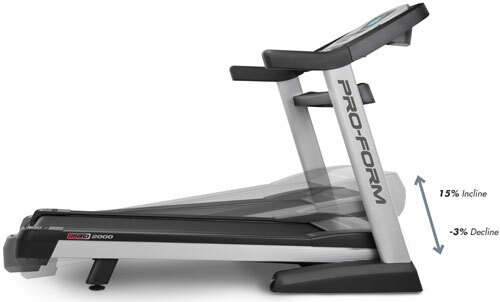 Pro 2000 Get the ultimate workout experience with the ProForm Pro 2000 Treadmill. A Mach Z Commercial Pro Motor with 3.25 CHP delivers incredible power to every workout. And, with quick digital controls, you can adjust your incline up to 15% and decline down to -3% for more variety and customized training. The included wireless chest strap will keep you in your target zone for optimum results while the extra-long 20” x 60” treadbelt offers plenty of room to stretch out your stride. 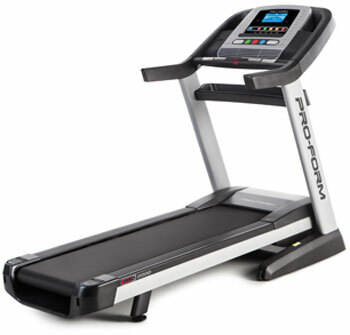 Take your workout to the next level with the Pro 2000 Treadmill. 3.25 CHP Mach Z Commercial Pro Motor: Through the use of high-end, commercial bearings and brushes, this motor delivers the longest, most powerful drive possible. 8" Backlit Display: Perfectly clear and easy to read, this oversized, 8” display has a large viewing angle so no matter how tall or short you are, you can always keep track of your workout progress. Displays your speed, time, distance, incline, pulse and calories burned. 24 Built-In Workouts: Choose from 6 Calorie-Burn Workouts, 6 Incline Workouts, 6 Intensity Workouts, or 6 Speed Workouts. RaceTrack Display: Track your progress on a track-style display. It’s easy to monitor your speed, pace and distance with this visual, quarter-mile racetrack. Dual-Grip EKG Heart Rate Monitor with Polar Wireless Chest Strap Included: Stay in the right training zone with this wireless heart rate monitor that automatically communicates your heart rate to your treadmill as you exercise. It also features 2 hand-grip sensors that are conveniently built-in to the handlebars. 350 lb. 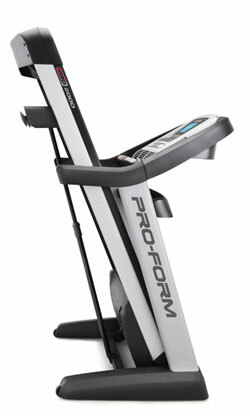 Weight Capacity: The ProForm Pro 2000 accommodates up to 350 lbs. Train around the world with workouts Powered by Google Maps. 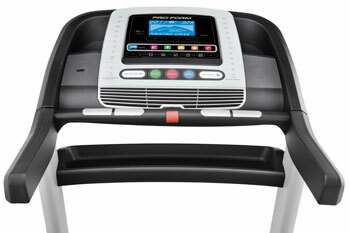 Now, you can draw your favorite courses and the Pro 2000 Treadmill automatically creates personalized workouts. And, the resistance adjusts to match the intensity of the terrain so the elliptical does what the street does! Lose weight with Jillian Michaels—America’s Toughest Trainer! Jillian’s voice coaches you through your own unique weight-loss program to help you reach your goals. Delivering progressive, 8-week training, new workouts are wirelessly and automatically downloaded every day to the Pro 2000 Treadmill. Each workout automatically controls your resistance to maximize your results. *Requires iFit Live wireless adapter. Wireless adapter sold separately.